Last week everyone who lives in the Pacific Northwest learned that we are destined for doom thanks to a cheery New Yorker article about the impending mega earthquake and tsunami that will crush us all. Needless to say the article was a total buzzkill. I live in Seattle. I love this city. I have spent the past week in various states of horror, alarm, denial and overwhelm. It’s been like my own version of the movie Inside Out, but the main emotion is a girl named Panic who obsesses over catastrophic scenarios and shits her pants all day long. On the one hand, I’m grateful for the heads up. Thanks, New Yorker, for describing in vivid detail that my neighborhood will be “toast” so I can plan accordingly. On the other hand, what am I even supposed to do with all of this doomsday information?! It’s too much! I don’t do well in a crisis! My judgment becomes impaired and I lose touch with rational thought. If I should duck and cover, I will probably stand up and run. If I should run, I will probably stop, drop and roll. Surely there are others like me. Couldn’t you at least have provided a 1-800 number we can call to get airlifted out RIGHT NOW?!? Fortunately a few follow up articles painted a slightly less dramatic picture and provided more detailed actions to take. Experts say the #1 thing to do is have a plan and be prepared. So I put on my grownup pants and found a list of items that should be included in disaster kits for people in this area. I went to Lowe’s in an attempt to start chipping away at the ten thousand things I need to purchase. Good job, Amy! Baby steps. I got to Lowe’s and wandered around in a stupor for at least 10 minutes before I found anything on my list. I was so overwhelmed that the only thing I bought was duct tape. DUCT TAPE. I don’t even know why duct tape is on the list. Am I supposed to tape my house back together?!? 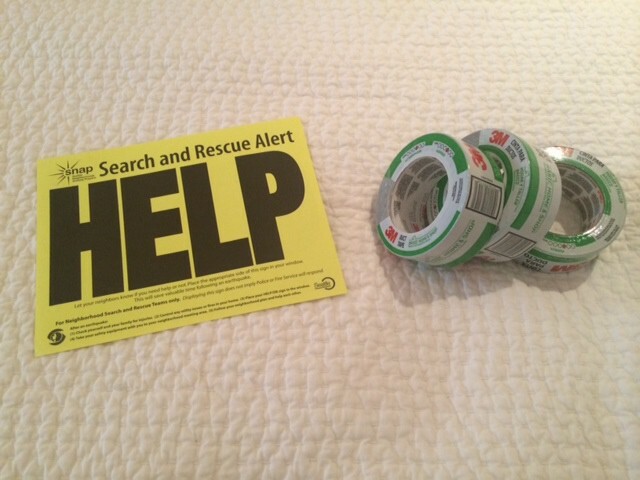 Fortunately I also have a Search & Rescue sign that I got at our block party last year, which you put in your window if disaster strikes and you need help. I’m totally prepared. To tape this sign to my window and then die of starvation/injury/a nervous breakdown. My husband was gone last week (which no doubt contributed to my heightened anxiety), but he is now back and able to help with Operation Disaster Kit: Take Two. I’m going to let him focus on supplies from the hardware store while I stick to my strengths. I’ll be over here hoarding barrels of peanut butter, buckets of beans and military-grade containers of freeze-dried beef. Now, who wants to come visit? How does someone all the way on the East Coast have the nerve to boss you around over there in Seattle?? Geez, it’s like they have some specialized weather equipment thingys or something. Come to the Midwest where the Earth doesn’t shift from underneath you. It just blows houses to itty bits. I grew up with tornadoes so I think my next move should be to hurricane territory just to round it out and keep my anxiety in full swing. Oh Amy! I so feel your pain, I really wouldn’t be able to handle another Seattle earthquake! Shawn knew all about the Ring of Fire, says grab some rice, water, flashlight and have Dan build a reinforces safe place to hideout, you’ll be fine. I don’t know if I fully agree with Shawn, sounds like everything west of I5 is a goner. That article is crazy! Dan won’t even read the article. He and Shawn think alike. Lucky for him I’ve read the article, and 47 others, just to make sure I’m over informed and paranoid. Ah, Northwest. Dear, sweet Northwest. We know this fear. This fear is not like tornado or hurricane fear. This fear has no warning system. The duct tape is for securing plastic sheeting to broken windows. So get some plastic sheeting and a big box cutter. Windows: check. Put a bunch of pop-top cans of protein in a huge Tupperware bin. Food: check. Ditto gallons of water. Cycle through those every year or so to keep it fresh-ish. Water: check. Two big 5 gallon buckets and kids, with large garbage bags. Toilet: check. Keep you car fully fueled and stocked with emergency water. Always. Cash and legal docs in a backpack by the door and another in the car. Spare meds and glasses in both packs. Hand crank radio, flashlight, and tampons in both packs. And backup your computer to the cloud. And decide in which backpack to store creepy baby, for old time’s sake. Thank you thank you. I’m just going to move in with you. You’re welcome to. I stockpile jelly beans “just in case” of “major geologic activity.” Lots of them. And they need to be cycled, to stay fresh. Naturally. I saw people sharing that article and holy hell! Talk about panic. Um, I don’t really know what to add since here the closes I get to an emergency is the monthly air raid siren they do every first-of-the-month-Monday at noon. Which in itself unnerves me every time I hear it. I can’t imagine how the old-timers feel. An air raid siren! Sounds alarming and yet oddly comforting. I’m a big fan of denial, personally. I hope that our camping supplies will see us through. Also, with my husband being a winemaker, we have a garage full of wine. So an earthquake would mean a garage full of glass, but I like to think that some of the booze will survive. I’m always excited when you post, by the way. Wine and camping gear is the way to go. I’ll be right over. And thank you! I lived in LA and we NEVER had an earthquake kit, although my husband used to keep several hundred dollars in cash hidden in a book in case of a big one that knocked out power and ATMs. He’s a thinker. I probably spent the money on shoes. We do have a tornado disaster plan, but we have to head to the basement several times a year because of tornado warnings, so that’s fair. When you start to get panicky about earthquakes, remember that they only have about a hundred years of statistics for an event that has been happening for MILLIONS of years. In other words, they can’t predict NUTHIN’ when it comes to plate tectonics. I always intend to stash emergency cash somewhere but then I spend it because I never have cash. I’m a very responsible adult. Dude. You can purchase a Disaster Preparedness Emergency Backpack Kit from Costco for a mere $139.99! It includes all of the essentials: batteries, water pouches, flashlights, dust masks, playing cards, and a Space Jam coloring book. Good to know. Worth it for the coloring book alone. I’m late to the party. I read that article and it totally freaked me out. And I live in Illinois. I say stiock up on ice cream. This has nothing to do with the earthquake, just general life advice. I’m pretty sure seismologists would agree with this advice.